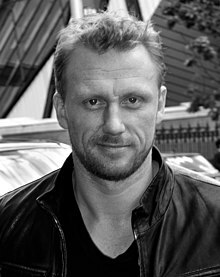 Kevin McKidd (born 9 August 1973) is a Scottish actor. He has played many acting roles such as Lucius Vorenus on Rome, as Dan Vasser on Journeyman, as Poseidon on Percy Jackson & the Olympians: The Lightning Thief, and as Dr. Owen Hunt on Grey's Anatomy. ↑ Brian Lowry (2007). "Rome". Variety Magazine. Retrieved 2009-03-26. This page was last changed on 31 October 2017, at 02:11.